We sell premium paddock eggs laid with love by healthy, free range chickens that roam wild from sunrise to sunset. Availability of re-usable egg trays to reduce carton waste. Our happy little ladies lead an idyllic country life exploring the grassy pastures of the Macedon Ranges. And to ensure there is plenty of room for activities at 'The Good Life Chook Day Spa', we keep our ratio of chickens to just 300 per hectare, which is exceptional by industry free range standards. Learn more about how we compare to the industry guidelines for 'free range' eggs. 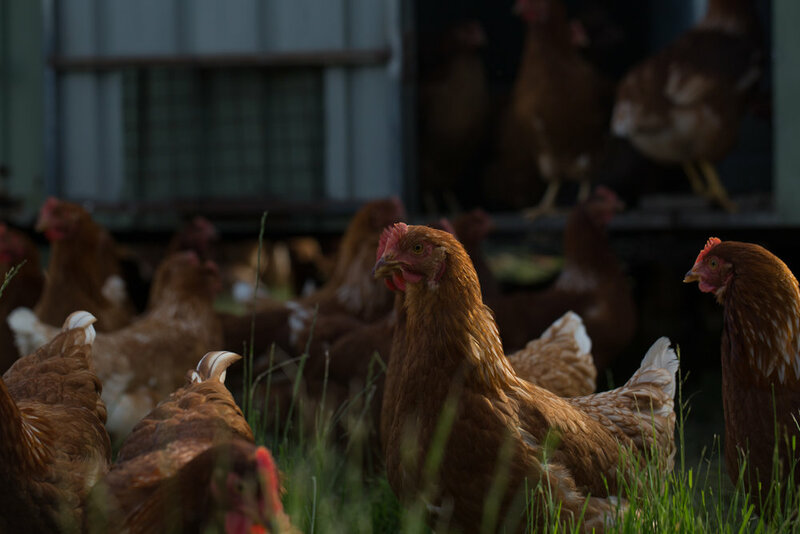 Our healthy hens pass their daylight hours foraging grassy pastures under the shade of gum trees, then toddle home to roost for the night inside comfortable mobile 'chook caravans'. These five star chook caravans are moved regularly around the farm, providing fresh land to grub around in. This technique is also part of our regenerative farming method, ensuring all the paddocks receive an equal portion of chicken love, with nutrient-rich chook poo adding natural goodness back into the soil. We chose our chook caravans based on the high standard of welfare conditions they offer chickens. Not all chook caravans meet these 'five star' levels. Our caravans ensure maximum comfort for roosting hens, so they have plenty of room to wriggle their fluffy bottoms, flap their wings, snooze peacefully and lay eggs joyfully. Our chickens eat naturally foraged food supplemented by a healthy diet of grains. We do not use hormones, and do cool things like feed our chooks apple cider vinegar, garlic and probiotics to boost their immune systems. A tasty zucchini tart made with The Good Life eggs at Lavendula Lavender Farm in Hepburn Springs, Victoria. We currently deliver our nutritious eggs on a weekly basis to convenient pick up locations from Bendigo through to Melbourne. You can learn more about how to join The Good Life Direct service in our video below! Alternatively, buy direct from the farm gate in Kyneton year round, or find the Good Life eggs at community and farmers' markets in the Bendigo Goldfields region. Click here to view our farmers' market date calendar for more information.